So, here it is. The world’s first online resource for War Grade Tyres. I should point out that I wasn’t around during WW2, and paid scant attention to school history lessons. Discovering minor details about driving, motorcycling and cycling during war conditions has been interesting. My original intention was just to document BSA manufacture, but that’s the nature of creating websites: they take on a life of their own. I’ll add more odd details as I find them. I used to wonder about the logo INFLATE HARD that I often came across on old bicycle tyres. 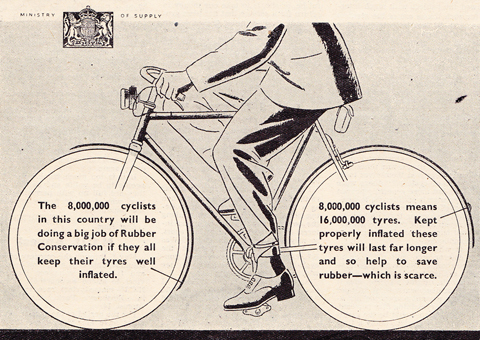 It was the result of campaigns by the Ministry of Supply (as above) and the tyre companies to conserve rubber. To which category do you belong? A patriot, careless, or an ally of Hitler? The 1937 BSA Piled Arms T74 Tandem is still wearing its old 26″ Dunlop Tandem War Grade tyres. It’s like putting on your favourite old jeans every day even though they’ve matured beyond tatty. The BSA Airborne has a 26″ Dunlop War Grade on the rear (below). 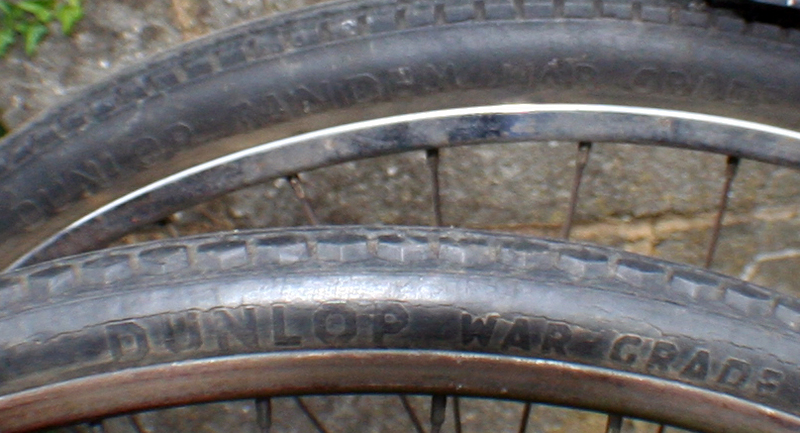 Below, you can compare the Tandem War Grade tyres with the ordinary Dunlop War Grade Tyre on these two bikes. 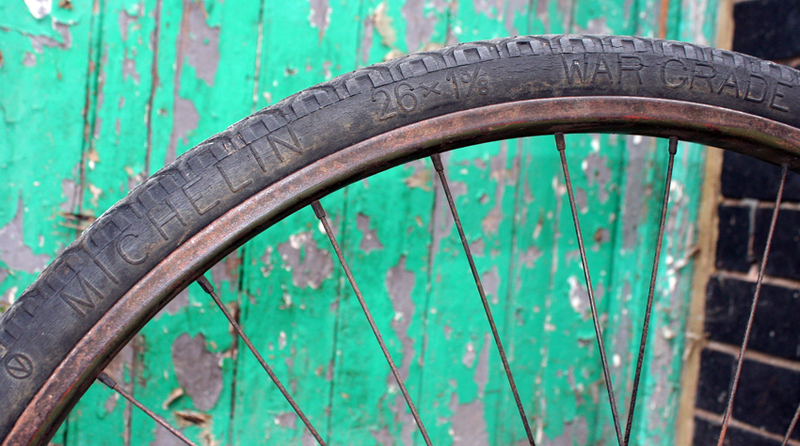 The 1942 BSA Mk.V has 28 x 1 1/2 Dunlop War grade tyres (below). 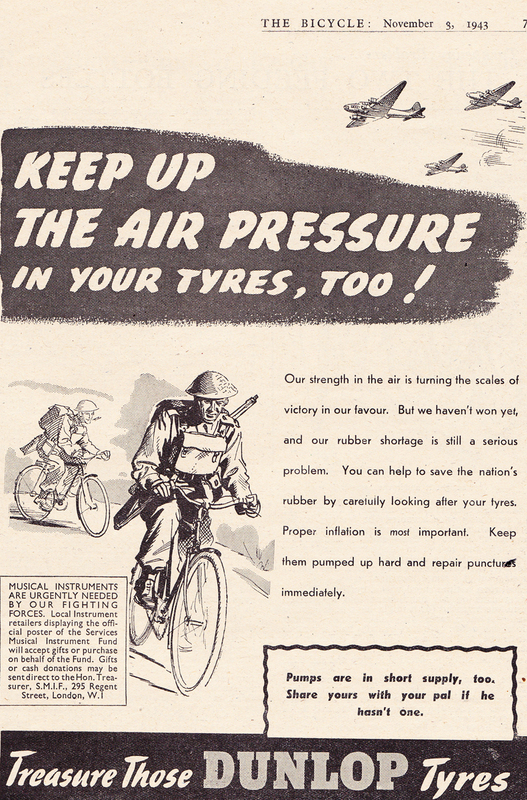 As well as obviously being used during WW2, War Grade tyres were sold still being sold after the War, and even after rationing ended in Great Britain in 1953. 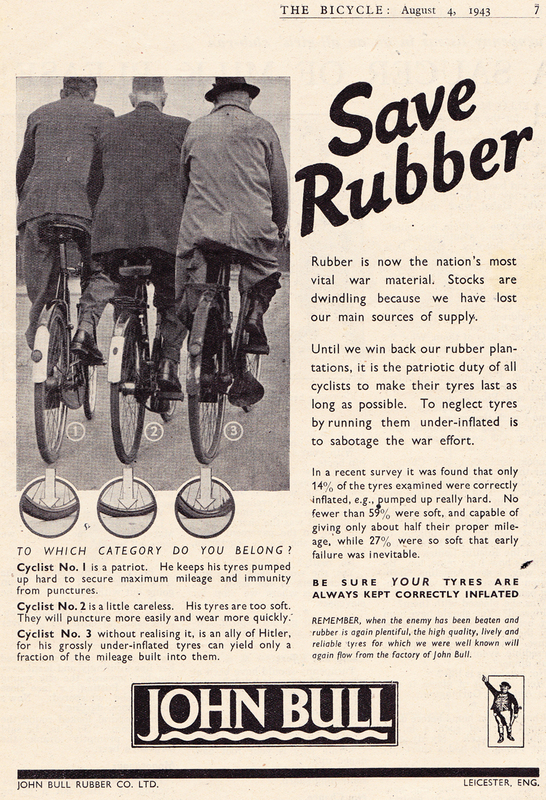 I assume Dunlop manufactured spare capacity during the War; and also that the description ‘war grade’ was a selling point postwar. 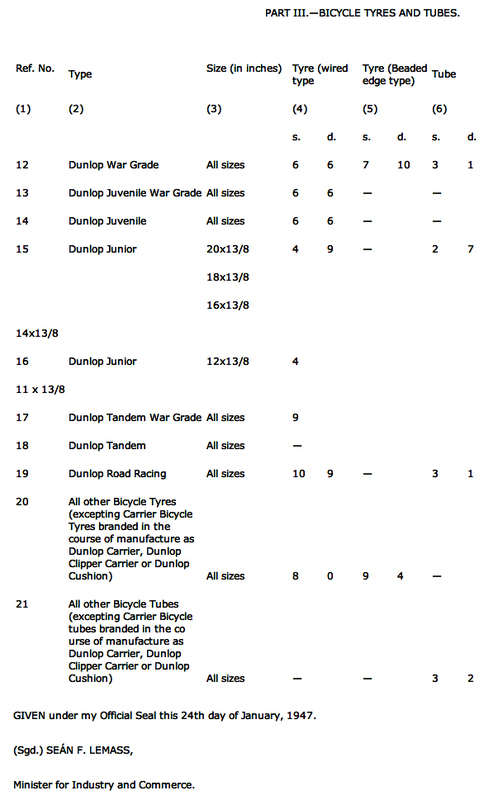 Here’s a copy of the Irish Government’s TYRES AND TUBES (MAXIMUM PRICES) ORDER, 1947 (from which I discovered there was also a Dunlop Juvenile War Grade tyre). Dunlop and Michelin were the most common War Grade tyres. According to Philip Moreau, other War Grade tyres available in WW2 were Firestone War Grade, Avon Avebury War Grade and John Bull Service Tyres. I have a John Bull on my 1919 Swift Cheylesmore. 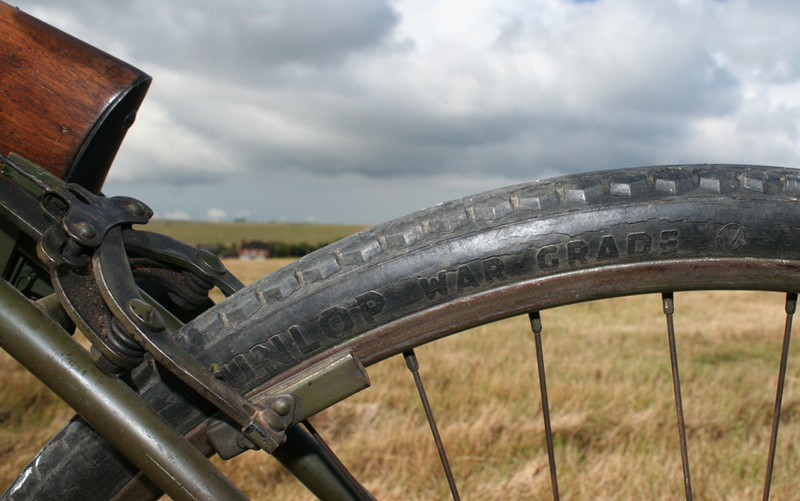 The front tyre on the BSA Airborne Bicycle is a 26 x 1 3/8 Michelin War Grade. 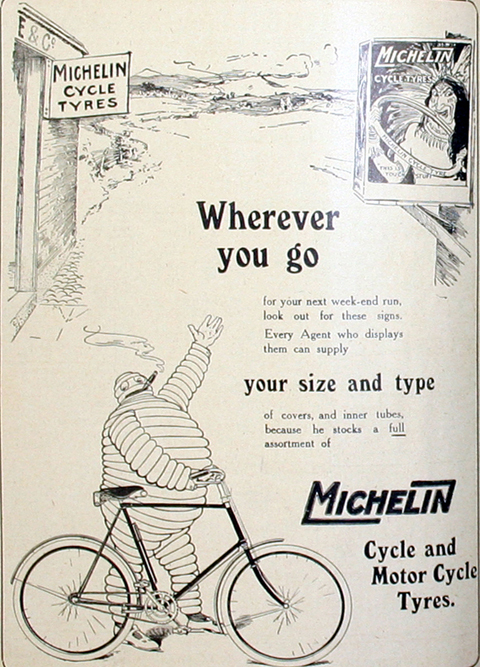 As well as a ‘V for Victory’ on War Grade tyres, the Michelin sports a rather fancy Michelin Man either side of the ‘Made in England’ logo. He’s got a glass in one hand and a cigar in the other. 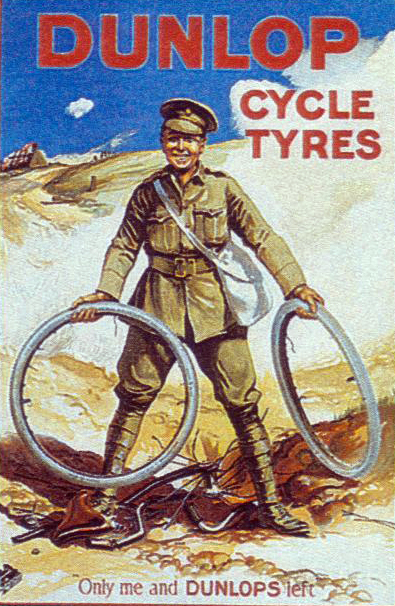 As you can see from the 1914 poster above, War Grade tyres were used in the earlier conflict too. 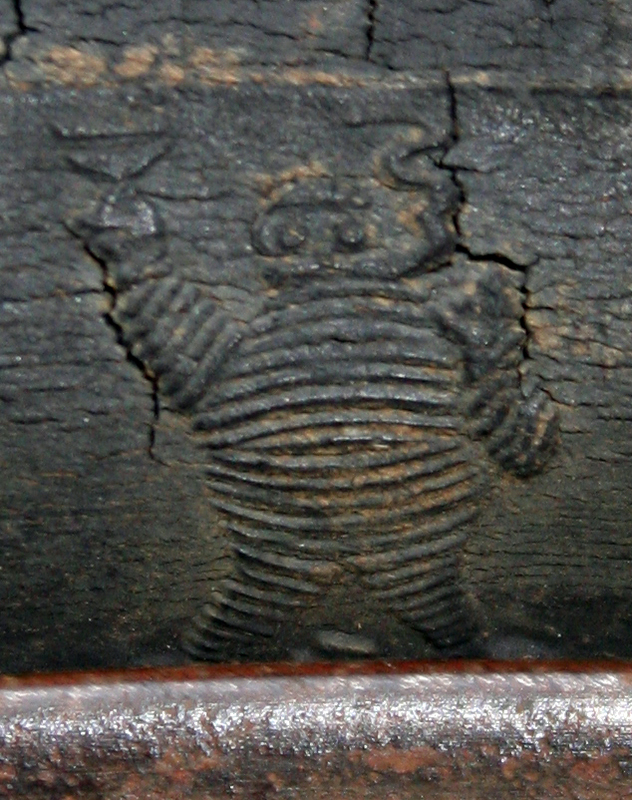 Below, you can examine a Britannia Advance Roadster 28″ War Grade Tyre from WW1. 1940s/1950s War Grade tyres are not uncommon; they were parked up when their owners finished with them with their old tyres still fitted. 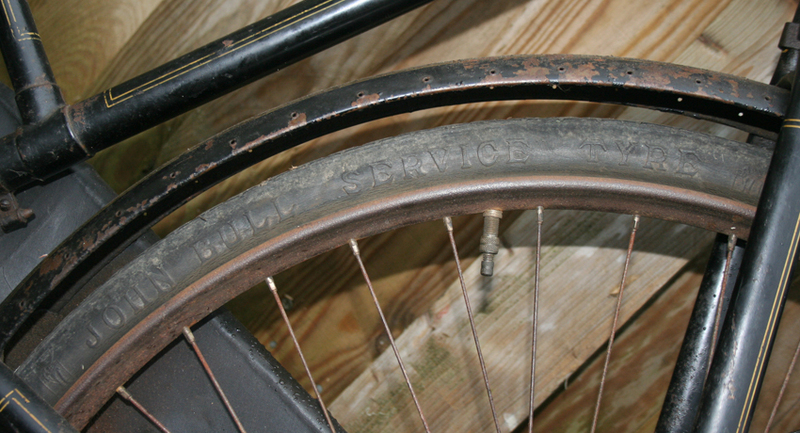 But WW1 tyres are now nearly 100 years old, so are much rarer. Even though this Britannia was too poor to use, when I took it off its bike I couldn’t throw it away. The font used on early tyres is noticeably different.